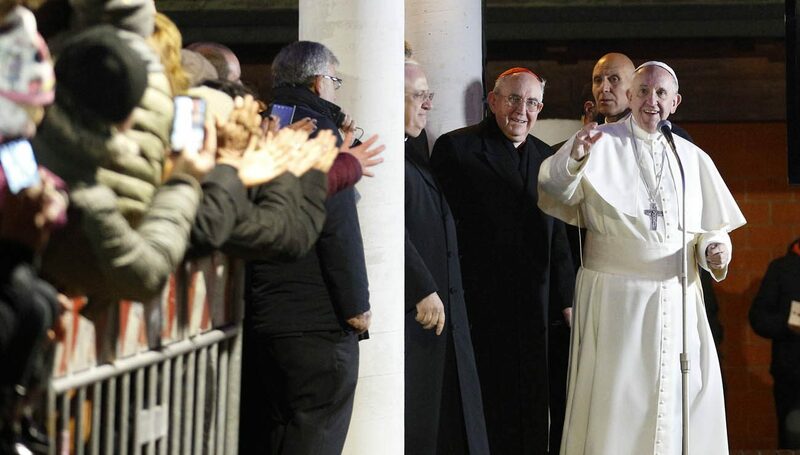 ROME (CNS) — Being a real Christian does not mean being a saint, but giving witness to Jesus in word and, especially, deed, Pope Francis told members of a parish on the eastern edge of Rome. As is his custom for parish visits in the Diocese of Rome, Pope Francis arrived in the late afternoon and held separate meetings with the children and teenagers from the religious education program and Scout groups; with the parents of the 45 babies baptized in the parish over the past year; with a group of parishioners who are sick or have disabilities; and with the parish council and more than 100 parishioners active in parish activities. Before celebrating Mass, he heard the confessions of four parishioners. The Vatican press office said they were the young couple who care for the 50-year-old assistant pastor, who has amyotrophic lateral sclerosis; a young man from the parish post-confirmation program; and the father of a sick child. “It is nothing other than being a parrot-Christian — words, words, words,” he said. Christian witness requires action. Celebrating Mass with a standing-room-only congregation and hundreds of people watching on jumbo screens outside, Pope Francis focused on the witness of St. John the Baptist, who pointed to Jesus as the Messiah. Christianity has spread throughout the world because people have given witness in word and deed to Jesus as savior. Sometimes, he said, the witness was given in small ways and other times through the great witness of martyrdom. “The apostles didn’t take a course to learn to be witnesses of Jesus,” the pope said. Instead, they followed him and listened to him and tried to imitate him. “Being a witness does not mean being a saint, but being a poor man or poor woman who says, ‘Yes, I am a sinner, but Jesus is lord and I will try to witness to him every day and to correct my life and follow the correct path,'” he said.